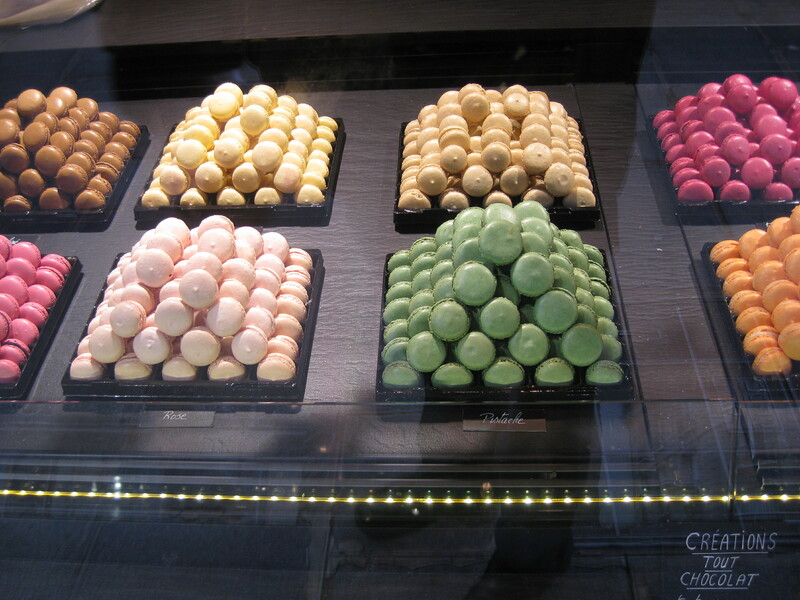 This is a fascinating post from Chef Percy Whatley regarding his recent trip to France. It is long, but worth the read. I would also think people would want to comment below. To all who have not had the pleasure of visiting this little country (France), it is now HIGHLY recommended by me. I had this little romantic notion of seeing elderly couples strolling down the road with an unwrapped baguette in the husband’s hand and the other arm was hooked around his wife’s arm in a loving gesture of togetherness. I envisioned a higher level of quality in their food ingredients, even at the basic level. I foresaw the perception of service in restaurants to be an overall better experience as well. I thought of very small cars and narrow streets and fast trains. France delivered to me all of this and much, much more. And, yes, the husband and wife and the baguette were there too! I was invited to France by Christian De Vos, vice president of food and beverage for Parks and Resorts. The main purpose was to visit the Sirha…a European Food, Beverage, and Hotel Expo that happens every year, and switches cities between Paris and Lyon. In the years in Lyon, the coveted competitions happen, including the Coupe de Monde Patisserie (World Pastry Cup) and the Bocuse d’Or. There is an obvious reason for my going as well, to see the international level of the Bocuse d’Or and to share this experience with others, as I have participated in the Bocuse d’Or USA twice. To begin the journey, I landed in Paris and stayed for two nights. I should have brushed up on some of the basic principles of the language because I was really lost! Overall, however, getting into the city of Paris from the Charles de Gaulle airport is not too difficult by train. I got off of the train at Gare de Lyon in the southern part of the city and checked into a little hotel. Overcome with excitement and knowing I had a very short time to experience this city, I walked directly to the Cathedrale de Notre Dame to do some sightseeing. On the way back, a lunch of Planche des Charcuteries and the crustiest baguette. The cutting board that was served had rillettes, saucissons, patés, cheeses, butter and an amazing sprinkle of yummy aspic all over the board. This cost about 18 euro with a beer to wash it down. It was pretty big, but I was hungry. In the states, at a place such as Bar Boulud in Manhattan, this would be $35, at least. But this was in this little bistro, in a little alleyway, and the best part…it was everyday food for the French! I was floored. So, I started to really pay attention to the menus posted outside of all of the food establishments that I passed in Paris (they are everywhere by the way) and all of them had very similar menu items, if not the same all together. Cote de Boeuf aux Frites, Andouillette Grillé, Ouefs au Mayonnaise, Salade Maison, Confít de Canard, Fromage, Pate de Campagne, Rillettes, Tartare de Boeuf etc. They also had a menu style called a Formule (formula) where you can have 2 or 3 courses and there are a couple of choices for each course available. If you did not want dessert, then you ordered 2 of the savory courses, or one savory and cheese, or one savory and dessert, it was flexible, but limited (a good thing). Another thing I noticed throughout France was that people STOPPED to take in their refreshment. There was no walking around with 32 ounce tumblers of some funky coffee drink and people running around from place to place. The French stop and smell the roses, to use a cliché. Something us Americans have not slowed down to do, but we are learning. All of the restaurants, bistros, and brasseries have a bar and there are no stools. People walk in, order an espresso or a small 10 dl (3.5 oz) glass of wine. Take 10 minutes or so to enjoy, talk to the bar keeper or owner, and then say their goodbyes and walk out. It was very enlightening to me. 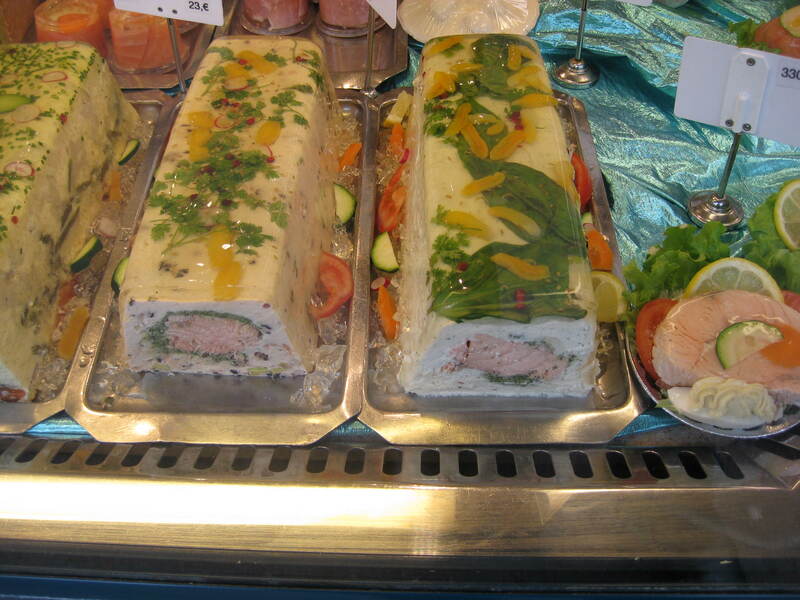 Fish Terrines at an outdoor market in France. 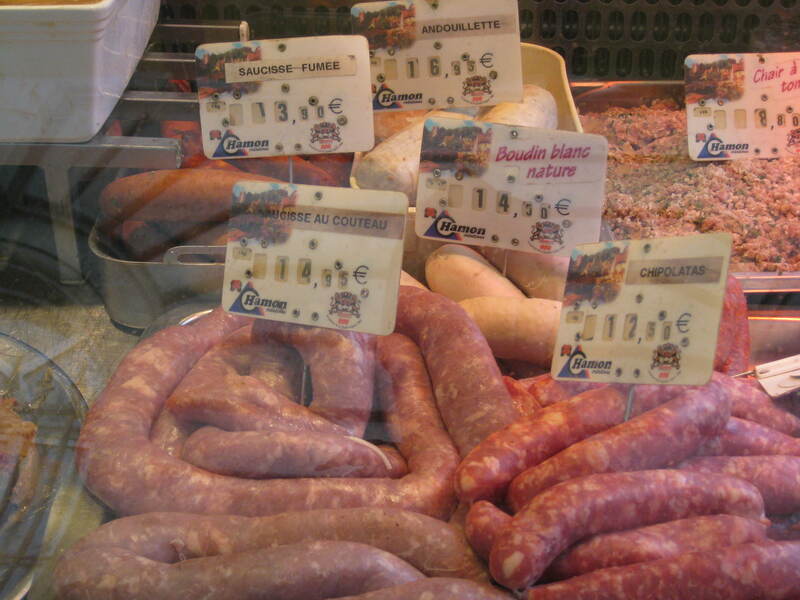 Sausages at an outdoor market in France. Day three was a train ride to Lyon on the TGV. The best way to get from one place in the country to the next is the train. The TGV is a high speed rail and it was my first time using such transportation. It was spectacular. In the train station in Gare de Lyon in Paris is food that is undeniably good. A fine dining restaurant is upstairs called Le Train Bleu http://www.le-train-bleu.com/uk/index.php. We did not eat there, but seeing a restaurant that has a 100 year history, and is kept up to the immaculate standards, is a lesson to us in this industry. Check out the website and you will see. We arrived in Lyon around lunch time and rented a car to get to our hotel 75 km south of Lyon. It is in a little village called Épinouze near Chanas. This area is known for its fruit tree orchards as the other side of the Rhone is full of the world class vineyards. The hotel owner is a friend of Christian’s and we had a wonderful time there for 2 nights as we traveled back and forth to Lyon to the food show. By the way, a French breakfast shout-out…baguette, croissants, cheese, butter, confiture (jams), juice and coffee…no eggs, no bacon or sausage, no hash browns, it is just not what they eat for breakfast, which I liked the change of pace. So, the food show is at the EuroExpo in Lyon. A huge facility making the McCormick Center in Chicago seem small. 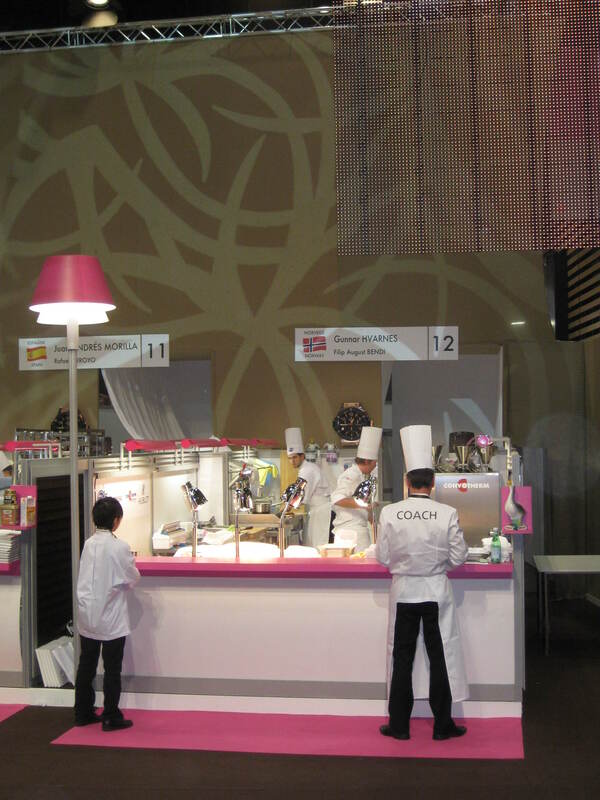 Each hall had a theme, one for coffee, one for breads, one for equipment, one for food, one for hotel, one for china, etc. The Espace des Chefs was where the competitions were happening in the Hall de Bocuse named in honor of Msr. Bocuse himself. We walked most of the show on the first two days allowing me the third to enjoy the competition where Team USA was on stage. 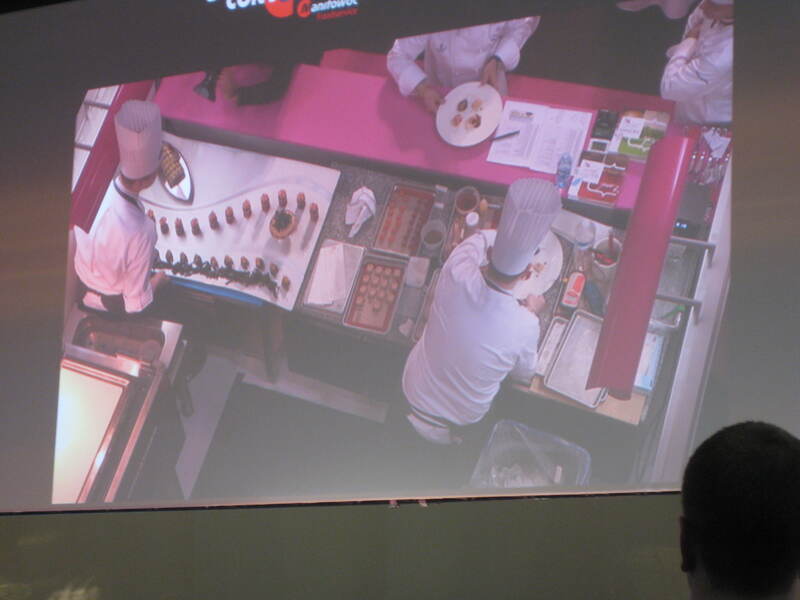 The show, however, was interesting as Europe is years ahead in technology in foodservice. Sous Vide was prominent throughout, Combi Therm oven technology is standard as well. The overall quality of the basic, standard ingredients was much higher than most of the products that we call “upscale”. There was a lot of regional and AOC use, similar to our own regional products, but an overall better marketing campaign. Bordeaux, Burgundy, Dijon, Provence, Rhone, Basque, Alsace…they all had their own section of the food hall, all marketing why their stuff is better than their counterparts. 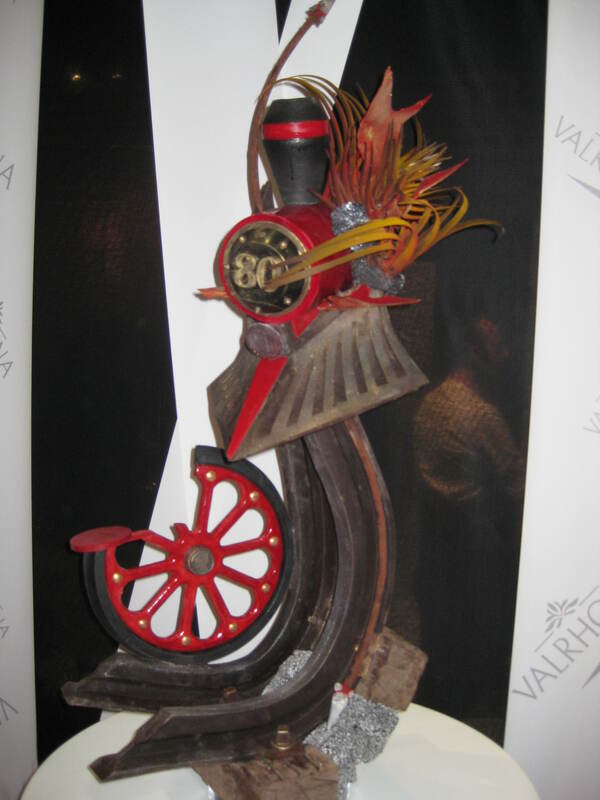 The competitions were exciting and of a completely different mindset for the visitors of the show. They took a different level of interest in the competition where in the US, most people just stroll on by what is taking place. 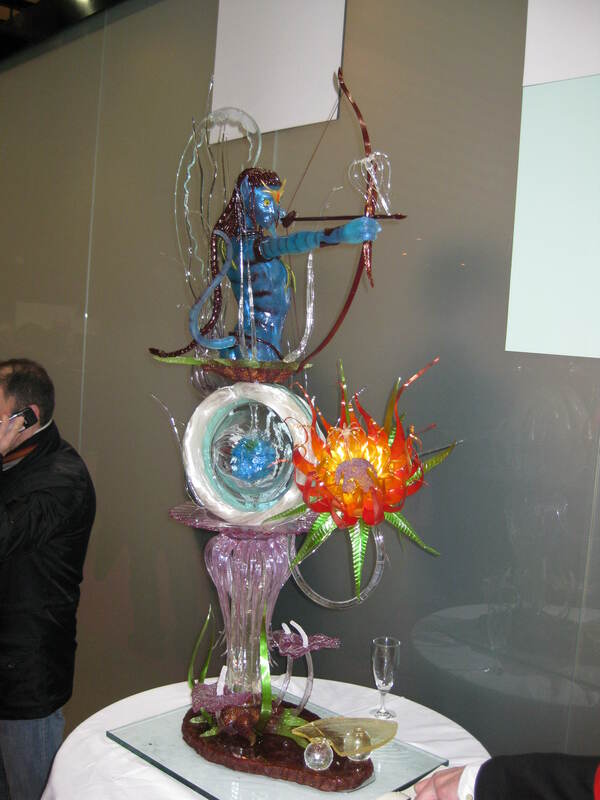 In the Coupe de Monde, there were queues of picture takers taking photos of all of the showpieces, of the chocolate sculptures, of the bread showpieces, of the sugar sculptures. There were literally hundreds of people doing this, and taking interest. Spain won the Coupe du Monde. I was not able to get a photo of their pieces. I wish I could have. 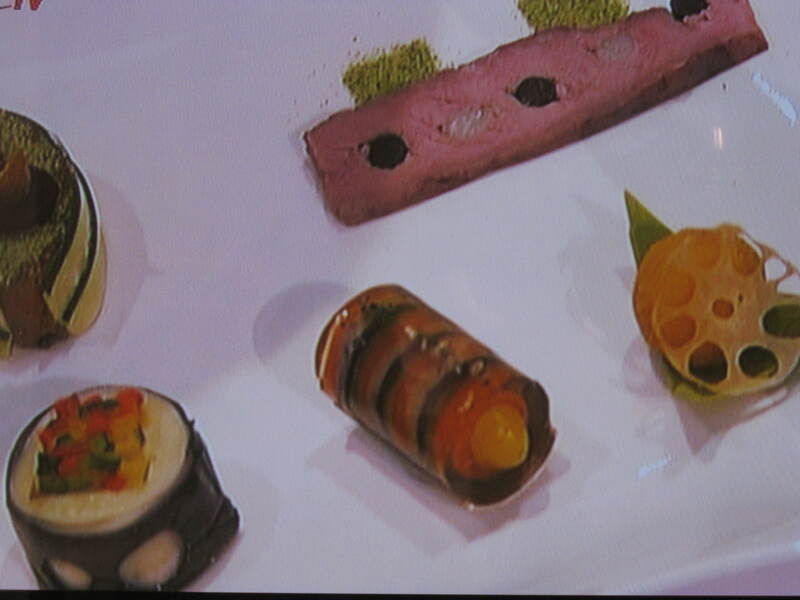 The Bocuse d’Or was absolutely crazy and intense. The crowd was all in their appropriate section with color coordinated shirts or vests with funny hats and painted faces. They all had noisemakers and each section would make their signature noise. Norway had a drum line with 8 drummers from a marching band making a lot of noise. The platters began coming out of kitchens at 1:30 pm, some were not so good at first glance, while some were absolutely spectacular. When Denmark’s came out, I really thought that they were going to be the ones to beat…I was right! They were 3rd of 12 for the day, their platter was a mixture of hand blown crystal vessels and sterling silver. Their layout was balanced and sensible and it is obvious that their flavors were top-notch. 40 of the possible 60 points is flavor, the rest is made up of presentation and technique. Visit http://www.bocusedor.com/2011/index.php/en/Concours/Accueil.html as the picture gallery will post in a few days. The US team was coached by Chefs Mark Erickson CMC, from the CIA and Gavin Kaysen from Café Boulud. During the competition they seemed comfortable and pretty confident. The chefs in the kitchen, James Kent and Tom Allan, looked good and were a good 20 minutes ahead of their timeline. When they started to put their platter together, it looked sharp with good flowing lines and enough height to give it some structure. Their fish platter was a frosted glass platter with a silver mantle for their main piece. It was the most simplistic presentation of the day, no fuss, very clean. Their meat platter was a little more showy with a Manhattan-like theme with wheat grass in the middle similar to central park…you will have to see the pictures to get the vision I am talking about. You could tell that they felt good while plating the portions of the meat, that they finally made it to the end of this journey. After all of the training, it was finally over and in the judge’s hands. I had my fingers crossed for them, and our entire country, to be able to put the US on the culinary map, something that we have only come in 6th twice in 12 tries. During the awards ceremony, I was nervous and hoping that we would hear “Etats Unis” and it would be our time to get on the podium. It had the typical pause for dramatic effect when the envelopes were opened one by one…Best Fish…Switzerland, Best Meat…France (oh man did they look disappointed! 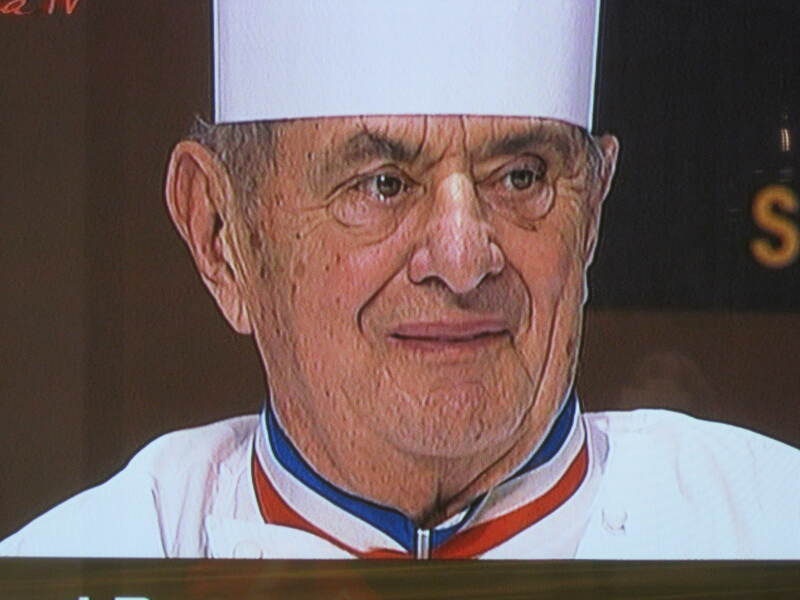 ), Bocuse de Bronze…Norway (they looked disappointed too), I am getting nervous now…Bocuse d’Argent…Sweden…Oh Crap!!!?? 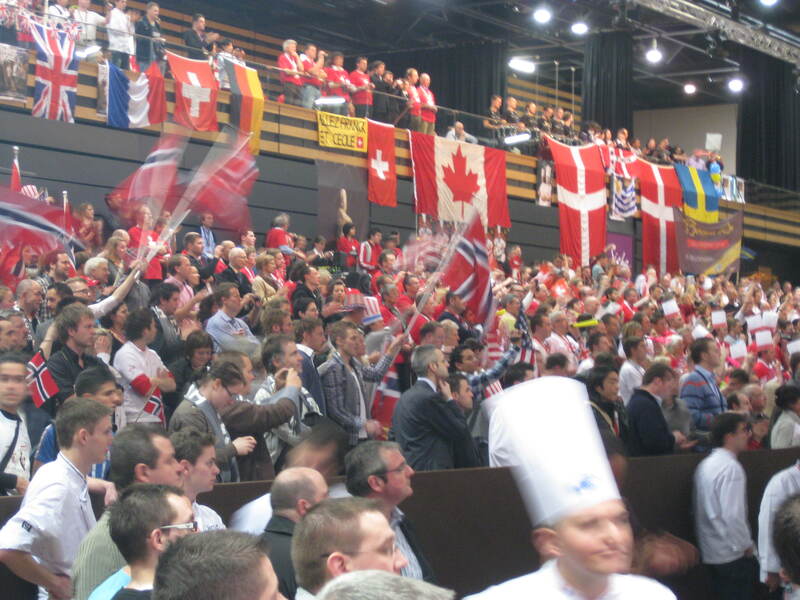 ?…Bocuse d’Or…………..Denmark!!!! I hung my head a little low in disappointment, as the French say… “c’est la vie”…and we can only hope that it goes better in 2013. I also was thinking to myself, what is it going to take? I took the train back into Lyon to meet Christian for dinner. We had an amazing experience at a little Brasserie with some table-side carved cote du beouf and some amazing Rhone wine. I was overwhelmed from the day, drained from anticipation and anxiety and needed some rest. We had a 5:00 am wake-up to catch a 6:00 am train to Nice. Coming into the Cote d’Azur woke me up from a hazy mental morning. It was sunny (we had not seen sunshine for 6 days now) and the temperatures were much warmer. Nice is right on the Mediterranean, with lush grass, flowing palm trees and a much quieter ambiance. We visited the Lycée de Paul Augier, a hotelier school that Christian has worked with in the past to attract interns into the US. The Ahwahnee has had the pleasure of having four interns over the years, all very promising hospitalitarians. We toured the school and had lunch of sweetbread and mushroom tart, female venison steak with red currants, brie, and savarin with fruits éxotique…and of course…wine… A 2001 Chateau Neuf du Pape that was out of this world! Buzzed on a heavy lunch and a couple of glasses of wine, we checked into the hotel and went for a walk. Nice is a tourist destination and the area we stayed is called the Golden Triangle by the locals as the stores were Gucci, Hermes, Prada, Tissot, Mont Blanc, Coach, etc. There was a little promenade of restaurants nearby and we strolled around checking out the menus. It is very different down here as we see pizza, pasta, gnocchi, cous cous, salade nicoise, pissaladiere, loupe de mer, fruits de mer, etc. It goes without saying that the food here is “Mediterranean”. Monaco and Italy are a few kilometers away. But, the same style and culture…people stopped for their refreshment, they stopped to enjoy the moment and THEN moved on, NEVER before they had finished the task at hand. For dinner, we dined on Salade Nicoise, Pissaladiere and Beignets des Legumes. I departed France a very enlightened chef. I was given the ability to experience all of the things that I had envisioned about a visit there’ all of the things that I was told was going to happen all came to being during my time. The unconditional love that the French (and all of Europe for that matter) have for the sustenance they depend on, and they do not take any morsel for granted. It means everything to them, and I realized, and it was incredibly obvious, and such a stark contrast to the American viewpoint. We eat in our cars. We run around with gigantic cups of coffee and soda in our hands. We hustle to and fro like it is our last day alive. We MUST slow down a little and take in this great country of ours. Stop for a moment and look at what is in front of you and think to yourself, is this good enough, am I enjoying this moment? I had been making some changes in my own lifestyle over the last few years, to try to avoid any drive thrus, to sit down and eat, to make sure that I am pausing to enjoy, if just for a moment. After my time in France, it is going to be a higher priority to make it a habit and a ritual to do this. I highly recommend anyone to do the same…it is better for us. Enjoy some of the photos and thank you for your time to read this lengthy recap. Thank you Delaware North, Christian and Chef Roland for all of the support. This entry was posted on Wednesday, February 2nd, 2011 at 2:43 am and is filed under Uncategorized. You can follow any responses to this entry through the RSS 2.0 feed. You can leave a response, or trackback from your own site. 2 Responses to My Time In France. Wow! what a wonderful post thank you for the words of inspiration. I look forward to hear more about DNC close connection to the bocuse D’Or. Your blog makes me want to jump on a plane and enjoy slowing down and smelling the roses, perferrably at a little bistro! Just attended Chef’s Holiday, missed meeting you there but it was still an amazing time.